I hope you all had a lovely weekend! One of my favorite things as of late, has been combining comfort + style. There are so many trendy options right now to stay stylish + relaxed. Rompers, jumpsuits, maxi dresses and long, flowy skirts are all great options to accomplish this. There's just something so fun about Summer in that you can throw on something chic + easy and forget the layering. Don't get me wrong, I love Fall layers, but Summer is just so simple and laid back. I just have to quickly point out a few favorite things about this outfit. One - the color. I'm obsessing over cobalt lately. So fun for multiple times of the year and looks so chic with basics, like black + white. Two - the handbag. The hubs hooked me up with this for my birthday last week! 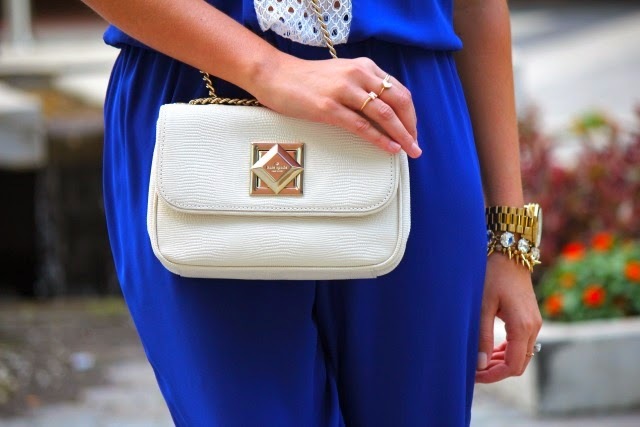 I can't find the original one unfortunately, but the Rebecca Minkoff white, mini mac is such a chic bag and super similar. Three - these Design Darling earrings. How fun are these turquoise, tassel statement earrings?! I'm obsessed with them. And last, but definitely not least, four - my new Dee Keller wedges. These sandals are SO fun and yet so comfortable at the same time. That just about wraps it up - I hope you have a lovely day and cheers to sunshine and summertime! Love that romper! Looks so pretty on you! Great earrings too! I love the comfort but cuteness of a good jumpsuit or romper! I made one (tutorial here ) and it is so easy to dress up or down! I am just absolutely loving this romper! Your hair always looks great! I love the color of your jumpsuit! That jumpsuit is so gorgeous! I completely agree on the colour, cobalt blue is such a pretty colour. Love this look! Gotta love a cute jumpsuit!! Your jumpsuit is gorgeous! I love your accessories! I love love love the color, that jumpsuit looks great on you! !